Give And Receive This Holiday Season!! As A Part Of Our Season Of Giving Campaign, Visit Our Locations Beginning On Thursday, November 1st, Through Saturday, November 24th – Donate A New/Unwrapped Toy + Receive A $10 Gift Certificate Toward A Future Visit*! 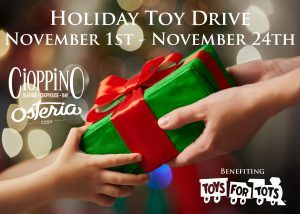 Cioppino Restaurant Group Will Match All Toy Donations And Will Deliver These To Mikey and Big Bob Of 96.1 KISS – Pittsburgh – Pittsburgh During Their Week Long 96.1 Kiss Stuff A Bus Toy Drive Event! !